We’ve already tuned this car a while ago in it’s street trim. At this time it just had the GT28RS, a turboback exhaust and injectors fitted. The following diagram shows the S14’s old setup compared to the new one, which includes a HKS suction kit, a Z32MAF and a high mount intercooler. Together with our CRTEK3, tuned with Nistune, transforms the once so tame SR20DET into a real track and drift weapon! 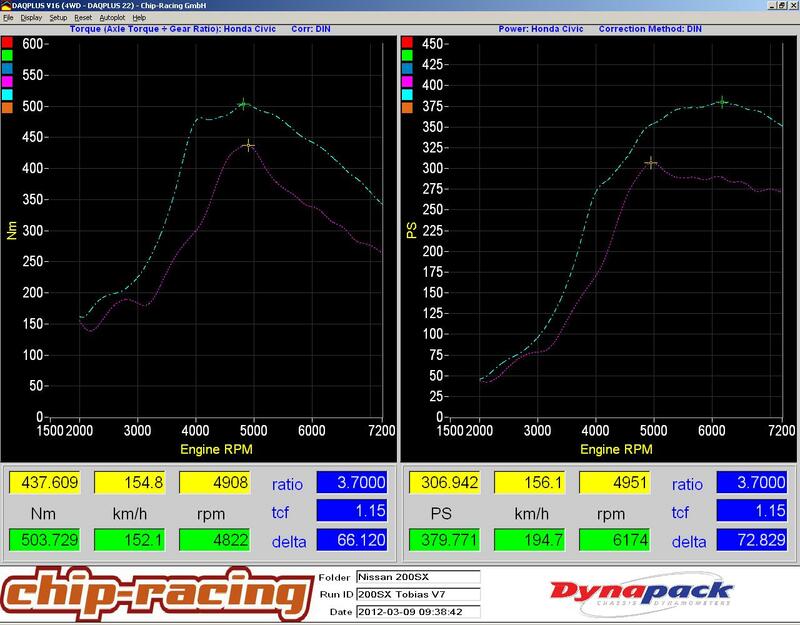 Here you can see the potential of the HKS intake and the Z32MAF. The factory airbox and MAF are just too restrictive at higher rpm’s, at about 5000revs there is simply not enough air to produce any more power! Another, very positive effect is the way the usable rev-band changed! The numbers increased over the entire rev-band, the SR20DET has a missive amount of torque at lower rpm’s, combined with many extra horses at higher revs! This diagram talks for itself when it comes down to driveability! The last diagram shows the boost-, torque- and power curve. The very smooth boost curve underlines our philosophy which we follow for years: A good tuned S14 absolutely don’t need a boost controller! 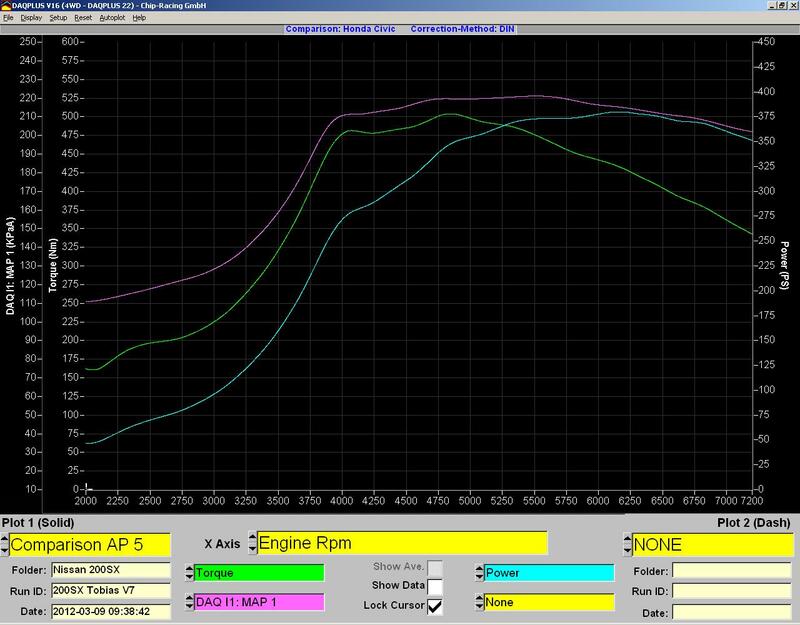 This curve proofs that a good tuned ECU can replace a expensive boost controller. It was achieved by a just perfectly tuned ECU with Nistune on the factory ECU! Please note: The boost curve includes the atmospheric pressure of about 1bar, so actual boost level is around 1 bar lower! We finally had the possibility to see the effect of the Z32MAF. We can now tell exactly when it’s needed or not. It’s not necessary if you’re running below 300hp, if you go higher you should upgrade to a Z32MAF with a good intake kit such as HKS or Apexi. The other thing we like to give on your way creating a good SR is to save the money for a boost controller, use it for trackdays, a good suspension upgrade or a proper intake system!